Amatrol’s Electronic Counter Learning System (85-MT5-E) adds to Motor Control (85-MT5) to teach electrical event counting in electrical motor control circuits. Electrical counters are used in a wide variety of applications including production counting, reject counting, sorting, and flow timing. The electronic counter training system features a digital 3-digit electronic counter set within a heavy-duty, 11-gauge steel slide in panel built to stand up to frequent use. This industrial training system also features world-class curriculum that covers counter and timer operation, designing circuits, and troubleshooting. Learners can then directly apply this theoretical knowledge to practice hands-on skills such as designing a timed one-shot motor control circuit, a timed repeat cycle motor control circuit, and a motor control circuit using the counter to tally operations. Learners can also practice troubleshooting a timed one-shot motor control circuit and a timed repeat cycle motor control circuit. The electronic counter system includes a digital 3-digit counter with totalizing, double pole double throw (DPDT) relay, and manual reset. Amatrol uses heavy-duty, industry-standard components to help learners better prepare for what they will encounter on the job and to withstand frequent, repeated use. This system features a slide-in, 11-gauge steel panel that’s pre-wired and terminated to banana jacks. Once learners grasp the theory of electronic counter operation, Amatrol allows them to put that knowledge into direct action through hands-on skill building. Electronic counters, in combination with Motor Control (85-MT5), is used to practice a variety of electronic counter skills like connecting / operating a one-shot timer, repeat cycle timer, and up counter, as well as troubleshooting a timed one-shot motor control circuit and a timed repeat cycle motor control circuit. 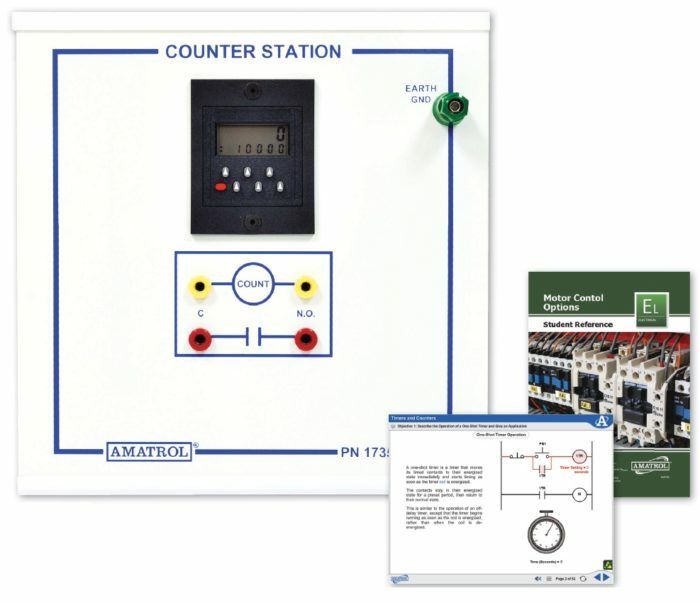 Amatrol’s Electronic Counter curriculum features in-depth theoretical knowledge that helps learners understand the “Why?” behind the concepts and applications of counters. This depth of understanding enhances the comprehension of component operation and troubleshooting because learners walk through entire circuits. Specifically, this training system covers the operation and application of one-shot timers, repeat cycle timers, and counters; the function of two types of counters and applications of each, and the operation of an up counter and a down counter and the ladder diagram symbol for each. The electronic counter training course is presented in an interactive multimedia format. This multimedia is loaded with 3D graphics, audio, and interactions to fully engage the learner and increase their comprehension of electronic counter topics by using multiple learning styles.